Today, we feast on The Princess Curse by Merrie Haskell and The Name of the Star by Maureen Johnson. Beyond the heroine, the other standout feature of The Princess Curse is the skill with which Ms. Haskell weaves together familiar fairy tales and myths, creating a book that is wholly her own. The Twelve Dancing Princesses is not one of my favorite fairy tales, though when done well it can be phenomenal (Juliet Marillier’s Wildwood Dancing remains my favorite retelling), but Beauty and the Beast? The heartbreaking despair of the Persephone-Hades (and Demeter) myth? Even a touch of Sleeping Beauty? I love them all, and The Princess Curse incorporates these different elements into a wonderful, unique melange, all on a Romanian mythological palate. 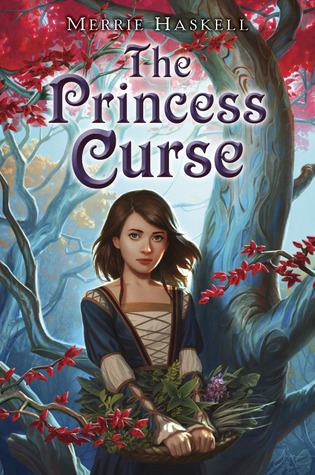 The Princess Curse is a wonderful, memorable tale and one that will absolutely be making my list of Notable Reads of 2011. And though I believe it’s a standalone novel, I would give anything to read more about Reveka as she grows up. In a twist that surprises no one, this is yet another case of a publisher underselling a book by choosing a cover that is not only misleading but also does this fantastic book a disservice. I mean, don’t get me wrong, it is a very pretty cover but one that screams “Middle Grade” and “lightness” and does not convey how utterly compelling, beautiful and even dark this book is. The departure point is a retelling of “The Twelve Dancing Princesses” from the perspective of Reveka, a young (13 year-old) herbalist apprentice who has recently moved with her father to Prince Vasile’s stronghold after growing up in a convent. Prince Vasile’s thirteen daughters have been cursed – although no one knows exactly how or what the curse entail exactly apart from the fact that every morning the princesses emerge from their chambers, exhausted and with blisters on their destroyed shoes. Anybody who has ever tried to know what happens every night ends up either disappearing mysteriously or falling into a sleeping state they cannot be roused from. To Reveka’s practical mind this is a silly curse of “shoes and naps” and she decides she is the one to break it. Her motivation is the reward the Prince is offering – should the curse-breaker be a female said reward comes in the form of a dowry which Reveka plans to use as a way-in into a convent where she plans to build and operate a herbary. That right there, those two aspects of the novel would have been enough for me to fall in love with this book. 1) I absolutely love that Reveka wants to go back to the convent because it is where knowledge is at that point in time but also how the story acknowledges that said knowledge is available only to those who can afford it. 2) I adored Reveka from the get go: funny and astute, strong-willed and practical, Reveka aims to break the curse because she knows she can and she goes about it with method and research. It is already appealing for me to have a retelling of “The Twelve Dancing Princesses” where the curse-breaker is a young girl motivated by wanting a future in which she owns and runs her own business and that motivation is not changed through the course of the story either (although it is definitely compounded with sympathy, compassion and love as extra drive). But if that wasn’t enough, half way through the book, the story morphs into something else – something else that is part Romanian-based folklore and history, part Persephone-Hades mythology retold, part Beauty and the Beast as well as Sleeping Beauty and even tasteful morsels of The Ballad of Tam Lin – while at the same time subverting all of those wonderfully meshed stories in really interesting, smart ways. The more I think about The Princess Curse, the more I find to admire: in terms of structure and story and how it seamlessly weaves all those different elements from diverse backgrounds. In terms of character and themes, beyond the awesomeness of the main character: there is the relationship between Reveka and her father which is always evolving; the acknowledgement that the princesses have their own motivation and doesn’t matter what that is, their father is a terrible father for wanting to break the curse by doing horrible things to his daughters; there is a conversation to be had about how unfair expectations are put upon young girls and how those could potentially alter their lives; about making mistakes and judgement errors and apologising for them; about how falling in love with someone does not necessarily mean that things will be magically solved or that romantic love is the answer to everything – because you still need friends and family and an occupation and maturity to make it work. What I am basically saying is: WOW. This. Book. Is. Awesome. And just like Thea, I too, would give anything to read more about Reveka as she grows up. I have yet to read a Maureen Johnson story that I didn’t like. Her books are generally infused with a generous amount of the type of humour (quirky, clever) I love, plus a dollop of awesomesauce and a teaspoon of freshness to make them stand out in whichever crowded genre she decides to write (Contemporary, Paranormal). Uninspiring culinary metaphors aside, The Name of the Star is a great book. I would say it has two main segments or shall we say, it’s part contemporary novel, part paranormal thriller and both are markedly different in terms of tone. Yes, yes, What Ana Said. 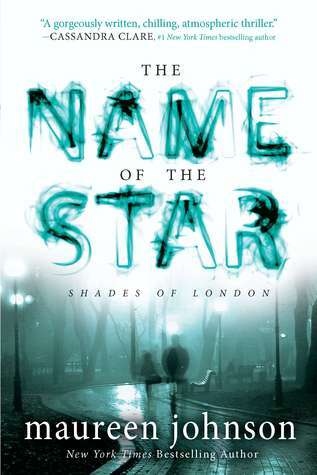 The Name of the Star is great fun, Maureen Johnson is in top form, and I loved the careful blend of contemporary YA novel with paranormal thriller. Both aspects of the book are equally strong, making for a memorable and highly entertaining read. The book follows Aurora “Rory” Deveaux, as she leaves the sweltering humidity of Louisiana for the London’s East End. Rory’s parents, both teachers, have decided to accept a position in Bristol; meanwhile Rory is to finish her senior year of high school at Wexford, a prestigious British boarding school. When she arrives at Wexford, Rory faces a steep learning curve – not only does she have to adjust to some ridiculously rigorous classes and snooty prefects, but she also has to deal with culture shock and become acclimated to her new British peers. And then, if that wasn’t enough, the murders start. Someone is prowling Whitechapel, killing women in the same location and manner of the notorious Jack the Ripper’s murder spree of 1888. But the murders are of a supernatural nature – and only Rory and a secret branch of the police are equipped to deal with the killer. As Ana says, The Name of the Star in fact does feel like a two-part book. In the first portion of the novel, we meet Rory and get acquainted with her quirky, wise-cracking ways as she settles into life not only at a boarding school but a British boarding school. She adjusts to the private school workload, she becomes acquainted with the realities of shared bathrooms and early morning wakeup calls. At the same time she learns the parlance of her new peers (e.g. the true meaning of “fancy dress”) and – horror of horrors – field hockey. She meets a boy she likes to snog, and she makes some great new friends. And then, there’s the other part of the story – the paranormal part. After a near-death experience with an ill-timed inhale of a chunk of partially-chewed meat, Rory has developed a peculiar ability to see the dead that linger on earth – that is, she can see ghosts. Because of her particular ability, she becomes involved in the investigation to find the Ripper killer, and a paranormal secret branch of the police department. While this two-parter is a bit of a curve ball (I certainly didn’t expect The Name of the Star to be a ghost story! ), I thoroughly enjoyed this twisty progression into Ghostbusters meets Buffy meets Torchwood fun. This, of course, is in large part due to Maureen Johnson’s brilliant writing, which is naturally witty, humorous as hell, and wonderfully sharp. I loved Rory’s character and her genuine amiability – she’s funny and hardworking, charismatic and dedicated to her friends but at the same time, fiercely independent. I love that she does NOT fall in instalove with the first cute boy she meets, and I love that she maintains her independence throughout the novel. On the less impressive side, the actual story itself is a bit familiar – the near-death experience combined with ghost sightings is pretty standard fare. Similarly, the portion of the book focused on Rory’s integration in boarding school life is also familiar territory. Meanwhile, the Jack the Ripper angle is well-executed, but hardly novel. I did love the integration of Jack the Ripper’s rampage of 1888 into present day with the copycat murders, and the identity of the killer is a nicely done reveal. And, all these things said, there’s little not to like in this book. I greatly enjoyed The Name of the Star and cannot wait to read The Madness Underneath very soon! I bought The Princess Curse because of your review, Thea, so I’m glad Ana loves it too. Now to get my hands on Maureen’s book. If you loved THE PRINCESS CURSE, keep an eye out for Haskell’s new novel, HANDBOOK FOR DRAGON SLAYERS. It isn’t a sequel, but a companion set several hundred years earlier in the same world. It has many of the same themes as the first book, but totally unique (and memorable) characters; and there is an awesomesauce shout-out to THE PRINCESS CURSE that had me laughing out loud. I’ve always found the Twelve Dancing Princesses quite boring–The Princess Curse sounds like a great retelling.